RVHS senior Rachel Horner attempts a spike over two Lady Oaks defenders during the Lady Raiders’ win on Wednesday night in Bidwell, Ohio. BIDWELL, Ohio — A great start led to a fantastic finish for the Lady Raiders. 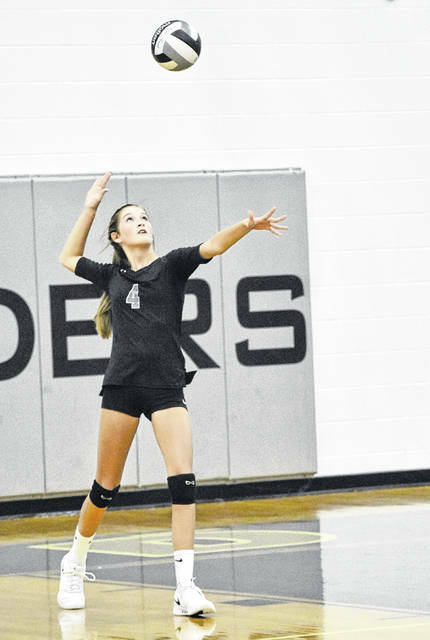 The River Valley volleyball team battled with the visiting Lady Oaks through five games in Wednesday night’s non-conference match, with the Lady Raiders earning a decisive win the deciding set to earn their first overall victory of the 2018 campaign. The Silver and Black (1-1) jumped to an early lead in the opening game, as they pulled out to a 16-3 advantage en route to a 25-7 win. After two ties early in the second game, Oak Hill (0-2) opened up an 18-9 lead. RVHS rallied to cut the deficit to 23-20, but the Lady Oaks ultimately held on for a 25-23 victory. The third game was tightly contested, as River Valley leaped to a 16-8 lead, but the Lady Oaks utilized a 14-6 run to knot the game at 22. The Lady Raiders, however, outscored OHHS 3-1 to close out the 25-23 win. Following at 4-all tie in the fourth game, Oak Hill never surrendered the lead again and rolled to a 25-19 win while tying the match at two apiece. In the deciding game, River Valley’s Mikenzi Pope stepped to the serving line and propelled the Lady Raiders to an 11-0 advantage. The Lady Oaks managed to cut the deficit to 11-1, but RVHS earned the next four points to close out a 15-1 win and 3-2 match victory. Following the match, River Valley second-year head coach Brent Smith was happy with his team’s performance — particularly with its ability to handle adversity. “We came out maybe a bit too strong,” Smith said. “We knew Oak Hill was a scrappy team. We found out at least twice. I was happy to see us hit a little bit more than we did in our previous match against Federal Hocking. I feel like our approach tonight translated to a lot better score rate in our first game of the season. The Lady Raiders service attack was led by Pope with 28 points and Alex Woods was next with 13. Kelsey Brown posted 10 points, while Rachel Horner followed with eight. Kasey Birchfield and Lora Kinney were next with four points apiece, respectively, as Jaden Bradley rounded out the RVHS service attack with one point. The Lady Oaks service attack was led by Peyton Miller with 17 points, while Caitlyn Brisker followed with 11. Beth Eiring was next with eight service points, followed by Chloe Chambers with six. 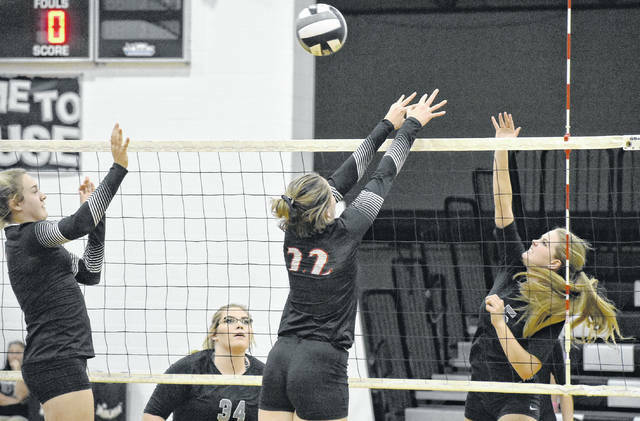 With the victory, RVHS earned its initial win of the season following a season-opening loss to Federal Hocking in four sets on Aug. 20 in Stewart. The setback was the second consecutive loss in five sets for the Lady Oaks, having suffered a 3-2 season opening loss to Wellston on Aug. 20.